Unlike other programming languages, PHP was designed specifically as a server-side scripting language for web application development. The latest version of PHP comes with several new features and enhancements to simplify and effectuate development of modern web applications. But the web developers still have option to execute PHP code in two distinct ways. They can either embed PHP code into HTML code or combine PHP code with various web frameworks or content management systems. Many developers take advantage of PHP frameworks to boost the application’s functionality and performance without writing additional code. The resources provided by various PHP frameworks further make it easier for programmers to accomplish common tasks. The developers also have option to choose from several PHP frameworks. But each developer must be familiar with some of the widely used PHP framework to choose the right one for his project. The usage statistics posted on various websites depict that Laravel is currently more popular than other PHP framework. The prebuilt code-blocks provided by Laravel enable developers to add functionality to the web application without writing additional code. At the same time, Laravel also provides a variety of useful libraries authentication, session, RESTapis and middleware. It further allows programmers to generate views by using Blade template engine, while availing features like middleware and routing. The large PHP framework is also supported by a large community of developers. But the beginners have to put additional time and efforts to set up and use Laravel properly. Despite having a small footprint, CodeIgniter is hugely popular among developers due to its robust features and concise documentation. 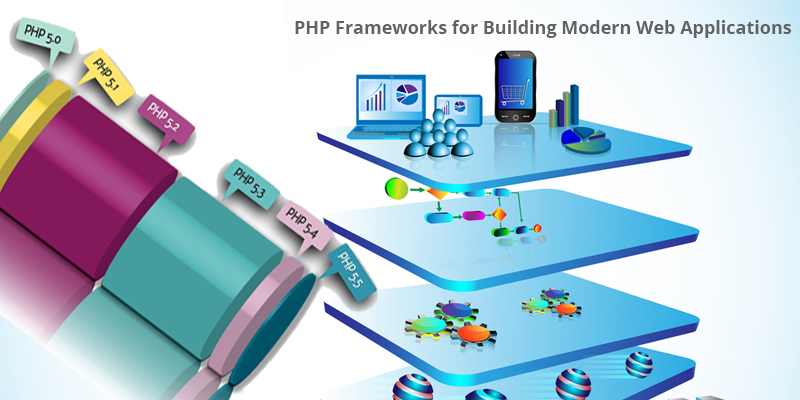 It further allows programmers to use PHP code inside the framework, while availing a variety of helper functions. The developers can use the existing helper functions and create custom helper functions to add functionality to the application easily. Despite recommending MVC architecture, CodeIgniter does not compel developers to adopt the software development paradigm. Also, the developers can install and configure CodeIgniter without putting extra time and effort. Despite being open source, Symfony is being managed by SensioLabs and supported by a large community. Unlike other framework, Symfony is designed as a set of development tools and methodology. But it does not require users to stay confined to its own environment. The developers have option to choose from a variety of components provided by Symfony according to their specific needs. The users can avail PHP components for security, validation, templating, translation and form configuration. The decoupled and reusable components provided by Symfony make it easier for developers to build and maintain websites without writing additional code. Despite being a micro-framework, Yii is simple, easy to use, and modern. The developers also have option to extend and customize Yii according to specific needs of a project. In addition to supporting MVC design pattern, Yii also comes with robust features like powerful user management, form input validation, built-in authentication, and AJAX support. At the same time, the security features included in Yii help developers to protect the web application from security threats like cross-site scripting, cross-site request forgery, and cookie tampering. The users can further test the application easily by availing the CodeCeption testing framework embedded into Yii. Zend is hugely popular among PHP programmers as a scalable and object-oriented framework. It allows users to avail several useful classes and libraries. But the developers are not required to use Zend fully. They can choose the classes and libraries according to specific needs of each project. At the same time, they can take advantage of object-oriented programming (OOP) concepts to extend the custom classes provided by Zend according to their specific needs. Zend further helps developers to keep the web application secure by using advanced security mechanisms and robust libraries. CakePHP is designed with features to enable developers to build PHP applications rapidly. These features make it easier for programmers to add functionality to the application with less code. The users can further avail the built-in features included in CakePHP to accomplish common tasks like database access, caching, input validation, translation and authentication. At the same time, they can avail the security features of CakePHP to protect the web application from common security threats like cross-site scripting, SQL injection, cross-site request forgery and form tampering. The open source framework aims to make PHP development both quick and comfortable. In addition to facilitating code reusability, Nette also supports concepts like MVC, DRY, KISS, SEO and AJAX. The advanced debugging tool included in Nette enables programmers to identify and repair bugs in the application without any delay. Likewise, the developers can avail the security features provided by Nette to protect the application from cross-site scripting, cross-site request forgery, session hijacking and session fixation. The users also have option to choose from a variety of add-ons and extensions, along with integrating Nette with other PHP frameworks and tools including Zend. The design of the lightweight PHP micro-framework is inspired by the popular Ruby framework – Sinatra. Slim allows programmers to manipulate HTTP request and response objects by including concentric middleware in the PHP application. The powerful router provided by Slim further maps route callbacks efficiently to specific HTTP request methods and URIs. Slim makes it easier for developers to control the external tools by supporting dependency injection. The tools and components provided by Kohana enable developers to build modern websites rapidly. The programmers can use the components provided by the PHP framework to accomplish common tasks like database access, code profiling, translation, encryption and validation. They also have option to add new libraries and extend the existing components without putting extra effort. The programmers can further use the debugging and profiling tools provided by Kohana to identify and repair performance issues without any delay. The simple routing structure and well-commented code further make it easier for programmers to assess and understand the code. Unlike other PHP frameworks, Phalcon is delivered as a web server extension written in C. The implementation boosts the execution speed and performance of Phalcon, while reducing resource consumption. The full-stack framework supports MVC design pattern, and provides a wide variety of components. The developers can further avail several useful features of Phalcon including dependency injection, router, auto-loader, ORM, cache, translation, template engine, form builder and flash messages. The micro-framework is written in PHP and designed based on Symfony. The developers can use Silex as a lightweight framework to develop small web application. At the same time, they can also extend Silex and develop large web application by using it as a MVC framework. They also have option to use the fat or slim version of Silex according to their specific needs. The slim version of Silex provides a basic routing engine only, while the fat version comes with a template engine, database abstraction, and several Symfony components. FuelPHP is designed based on the features and concepts used by other PHP frameworks. The modern framework further supports model-view-controller (MVC) design pattern, and supports a more router based approach. The developers can also avail a number of features provided by FuelPHP including HMVC implementation, RESTful implementation, ORM (Object Relational Mapper), caching system, template parsing, form and data validation, and vulnerability protection. On the whole, each web application developer has option to choose from several PHP frameworks. But the feature, performance and popularity of individual PHP frameworks differ. But each of these frameworks is open source and supported by active community. It is always important for developers to compare these frameworks based on their specific needs of each project to build the PHP application without putting extra time and effort.